Many people make this a base point for seeing other famous attractions such as the Grand Canyon, (a beautiful scenic 2 hour drive). Some people like to take a little detour when driving North of Flagstaff, and see Wapatki Ruins and Sunset Crater. Also, if you like antiques, Jerome, is an old mining town built into the side of a mountain with red rock views of Sedona. It is about a half hour away. 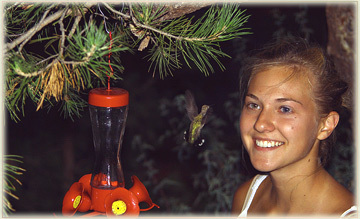 Hummingbird in Sedona Relax and hang-out with the hummingbirds, like Daisy did. Staying with us was a mom and daughter getaway for graduation. A moment never to be forgotten! 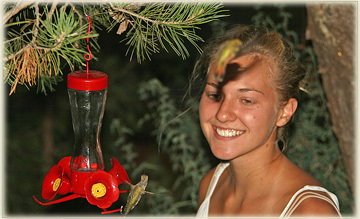 hummingbirds-sedona-cathedral-hideaway-bed-and-breakfast-sedona-arizonaTotal relaxation doesn’t usually happen until the third day. This occurs from sitting on one of our many decks and watching the hummingbirds, finch and many other beautiful birds and wildlife. Many have said, there is something mesmerizing about staring at Cathedral Rock and the glowing stars in the black, nighttime skis while lying on an anti-gravity chair with your bed pillow. There is also, something very special and personal about having a professional facial or massage without ever leaving the house. Many of the anti-aging treatments are FREE when staying for three to six nights with the seventh night FREE. Many, high, mountain view overlooks can be driven to with either a short walk or a long hike (whichever you prefer) to experience Sedona’s majesty. We have thousands of years of history here, with 300 archeological sites and the 130 trails and breathtaking red rock views wherever you look. Sedona was noted as “The Most Beautiful Place in America”, in USA Weekend. Rand McNally has chosen the drive up Oak Creek Canyon, which starts in uptown Sedona, as the 8th most beautiful drive in the U.S. Five minutes from our back deck is where Cathedral Rock reflects in Oak Creek. 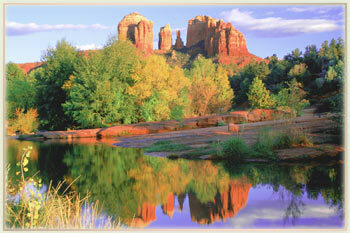 This is the picture you see in all the Travel Magazines when referring to Sedona. It is the rock formation that you see behind our B&B. You can see this from all of the rooms in the house. Many websites use Cathedral Rock as a picture on their site but that is only because it is a landmark. Cathedral Rock fall reflections in SedonaSedona Cathedral Hideaway is the only Luxury Bed and Breakfast that honestly has Cathedral Rock, (with the “Bride and Groom” visible in the middle) as the bedroom and living room view. This Cathedral Rock view was featured on the Arizona Centennial stamp in 2012, not the Grand Canyon. If casual fishing is what makes you relax, the creek is periodically stocked with trout. We are also a destination for creative art, including paintings, bronze sculptures, and jewelry designs you can only see in this area. There are many events here throughout the year that focus on originals from artists in Sedona and nearby. At the right time of year, you can watch them painting all over Uptown and West Sedona. There are over 200 resident artists. We have several Gallery Districts, so you can view many artists work all at one time. If you go to our home page: www.SedonaCathedralHideaway.com, and click on Guest Reviews, you will get an idea of some of the experiences our guests have had staying with us in Sedona. Most that stay even a week say they will be back as soon as possible because there is so much more to see and experience. You might want to review all the photo galleries on our site (under Activities and Events) to get an idea of the views from our Bed and Breakfast and also from nearby areas. When you call, we can decide if you want massages under the stars on our private deck, or in your room. We, also, suggest our private tour guide that can take you to exactly to the kind of trail that is best for your ability, for a less expensive price than traveling with many people on a jeep tour. 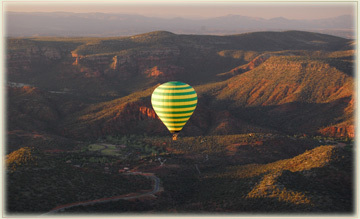 There are many other ideas on this site regarding what to do in Sedona, such as a hot air balloon ride or a helicopter tour. But we don’t want you to stress over making these decisions on your own. Just call us and we will assist you in making this vacation exactly what you need to go home feeling relaxed, happy and fulfilled. We look forward to hearing from you between 10 AM and 9 PM. Please keep in mind that we do not change our clocks when the rest of the country does.